In a market update this week aspiring gold producer Geopacific said the assay results from a 22-hole RC drill campaign at the Boscalo area of its PNG Woodlark Island Project were headlined by an exciting 11m intersection grading 6.75g/t gold from 69m down-hole and 3m at 11.99g/t from the 57m mark. Other solid results included a 7m intercept at 5.87g/t from just 41m, 2m at 3.20g/t from 84m and a 15m intercept grading 5.80g/t from 64m in another. The majority of holes at Boscalo have been drilled to a shallow depth of 120metres with some holes reaching 140metres. Only two months ago Geopacific announced that Boscalo was a new gold discovery, situated beneath shallow cover and adjacent to the Kulumadau East deposit at Woodlark Island in the Milne Bay Province. Boscalo was first identified with several broad and high-grade intercepts in June last year with the headline number at that time an 18m intercept grading 8.99 g/t gold. The company picked up around 86% of the Woodlark Island project for a bargain at around $10million in cash and shares last year after a previous operator spent $150m on it and ploughed 290,000m of drilling into it. Geopacific has subsequently drilled an additional 30,000 metres with infill and extensional drilling targeting an updated mineral reserve of 1 million plus ounces, enough to support an initial 10 year mine life. Geopacific has already initiated a countdown to its planned production schedule at Woodlark and is targeting a Definitive Feasibility Study during the third quarter of 2018. The latest drilling results continue to build confidence in the project with mineralisation still open at depth and along strike. 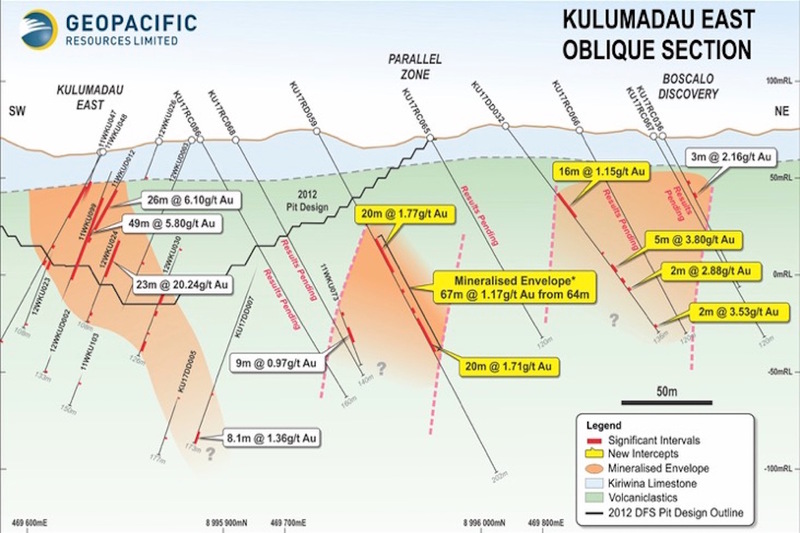 In addition to the main zone, Geopacific said a parallel zone of mineralisation between Boscalo and Kulumadau East has also been identified, further confirming the significant potential for additional gold discoveries in the area. The company also confirmed this week it had achieved its spent and drilling milestones to increase its ultimate stake in the project from 86% to 91% via direct ownership of the project and its controlling shareholding in former project owner Kula Gold. Geopacific’s agreement with Kula also provides a kicker that will see the ASX-listed explorer jump to 93% if it can define a mineral reserve of 1.2m ounces or more. With solid drill numbers seemingly rolling off the drill bit every time it goes down, that doesn’t appear to be out of the question.